Whenever one great civilization falls, another one rises up in its place. It’s no different in cinema history. The Disney studio released their 33rd animated feature, Pocahontas, in 1995. Pixar released their 1st. Toy Story was heralded at the time for innovation and novelty. It is remembered today for giving us the first adult film made for children. Toy Story goes to the root of all good children’s films: darkness. Sid is a toy-killing psychopath. His room crawls with toy abomination offspring of his cruel surgical experiments. Buzz contemplates suicide. It’s amazing how many people seem to underplay the importance of this very adult concept that develops towards the end of this great screenplay. Creatively utilizing its toy premise, Buzz is programmed with purpose. To protect his Universe. He is important. He is special. Or so he thought. After realizing there are literally shelves upon shelves of laser shooting, wing-spanning Buzz Lightyears, Buzz no longer has any desire to live. 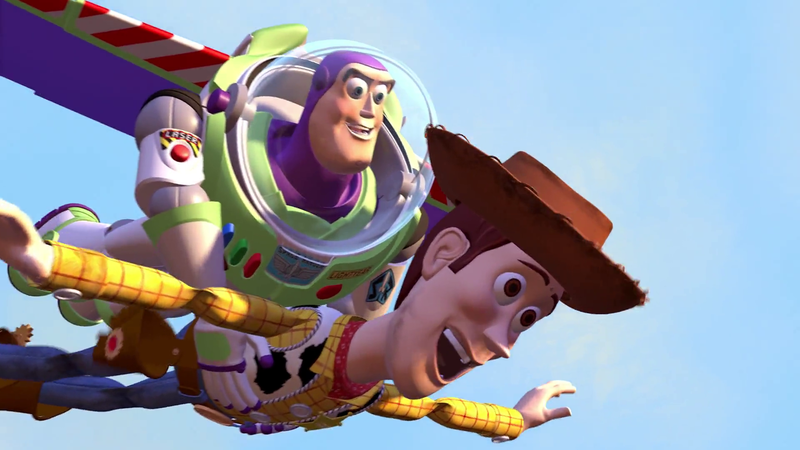 It is in this moment of crises when Woody redeems himself by teaching Buzz that far more rewarding than being important, is being important TO someone. Even a toy can be important in this world. Toy Story is one of those rare family films where children will come back to as adults and find completely different reasons to love it. Although the animation that was once so revolutionary is starting to date itself, it is its substance that will make Toy Story last to infinity and beyond. I’ve already written a 2200-word review of Toy Story for Earn This, so I won’t spend too long rehashing those thoughts here. In short: I agree with Kevin that this is a masterpiece, though the darkness of Sid’s room is a bit less memorable to me than the relationship between Woody and Buzz. Any scene focusing on their interactions is pure comic and dramatic gold, culminating in one of my favorite movie scenes ever: Their showdown at a gas station. Can you guess the Rotten Tomatoes score of A Bug’s Life without looking it up? 92%! That seems way too high, right? A Bug’s Life has gone down as a thoroughly mediocre affair for Pixar: Rote plot, rote characters. All around, just rote. That’s what people say, at least. And I think that’s unfair. A Bug’s Life is a very good movie. It has a likable protagonist, high stakes, excellent animation (a HUGE step up from Toy Story), and lots of humor. It shows Pixar’s cinematic taste developing. I still get scared when Hopper is eaten at the end: The way Pixar animated that bird was brilliantly framed, portraying it almost like a horrible monster. Pixar knows how to take advantage of its nascent medium — the sense of physical scope and size works so well with CGI, and they mastered it early. In addition, the circus bugs give the story plenty of visual delight and humor. Denis Leary as a male ladybug is a particular favorite. So why has its reputation tanked? Two reasons: First is that DreamWorks basically adopted the template of this movie not just for Antz, but for its entire brand of animated films: A misfit (who is either a talking animal or knows a talking animal) messes something up, does one good thing, screws a much bigger thing up, then redeems it by being true to himself and using his misfit trait. It was never exactly a groundbreaking story structure, but DreamWorks (and other, smaller studios) have really beat it into the ground, making A Bug’s Life feel retroactively bland. The second thing that happened to A Bug’s Life to tarnish its reputation is that Pixar grew more ambitious, more unorthodox, and simply better. A Bug’s Life felt a big frog in the pond until we saw Toy Story 2 and Monsters, Inc and… well, just about every other Pixar movie for the next fifteen years. A Bug’s Life is indeed leaps ahead Toy Story from an animation standpoint. Birds are usually associated with springtime and flowers, but that dose of darkness from Sid is mostly encompassed in this bird-turned-monster creation of Pixar’s. There is another grasshopper who might intimidate kids; I know he frightened me a bit. Beyond that, nothing in this movie indicated progression for the studio. The plot is predictable. The characters are not very interesting, although the two incomprehensible pill bugs crack me up every time. There is a great scene when Flik and princess Atta are just gazing upon the joy Flik’s lie has brought to the colony, and I thought I knew where Pixar was going. This was going to be about hope. How you need hope to live life, even if there aren’t many real reasons to believe in it. Really, this movie seems to condone Flik’s lie, considering how the colony sides with Flik only when he spells out the true relationship between the ants and the grasshoppers. This diffuses any complexity to the movie, which feels uncharacteristically like a kid’s film from a studio who knows how to make family films. 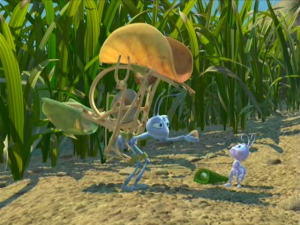 Favorite moment: Flik unleashes his mechanical bird on the grasshoppers. It’s difficult to say what Toy Story 2‘s reputation would be if it wasn’t for TS3. I personally know at least four people who have told me that they appreciate 2 more since 3 so movingly closed the trilogy. Before 3, I think the Toy Story movies had faded a little bit thanks to the overwhelming acclaim of later movies like Ratatouille and The Incredibles. But as it’s played out, Toy Story 2 has rightfully gone down as one of the greatest animated movies of the past quarter century. It’s, at different times, so funny, so exciting, so sad, and so thought-provoking. Above all, it’s a gripping and emotional story with a deeply resonant core. Who knew that childhood toys could be so versatile as thematic figures? Brian makes many good arguments in favor of Toy Story 2 as the king of the trilogy. I’ve always thought that Pixar never imagined they’d make a TS3 as they made part deux; TS2 reflects on the original so well. Buzz saves Woody, not vice versa. Buzz has to convince Woody that life as Andy’s toy is right, not vice versa. The human posing a threat wants to preserve toys, not blow them up. Potato Head makes lots of dismemberment jokes not… okay, well, some things stayed same. Jessie, Bullseye, and Stinky Pete are fantastic contributions to the Toy Story world, and “When She Loved Me” indicates the studio’s tearjerking muscles it would continually flex in later movies. In other words, TS2 is a masterpiece that had us dumb motherf***ers eating right out of John Lasseter’s hands. Favorite moment: The Buzz Lightyear aisle is funny (with some great TS1 references) but has always given me the willies… There’s something surreal about all those Buzz clones. Was Toy Story 2 really the movie that allowed Pixar to feature talking dogs in Up and still get nominated for Academy Award’s Best Picture? I didn’t think it was until Finding Nemo when Pixar had us by the leash, but it takes more than one great film to build such a reputation. Toy Story 2 is an inseparable piece in the Pixar pantheon and the beloved Toy Story trilogy. As Dan points out, Toy Story 2 makes some very logical moves to keep this sequel fresh. This story focuses around Woody this time. The human villain is radically different from Sid; there’s even a toy villain surprise in this one. But Toy Story 2 also adds to the established Toy Story cast. 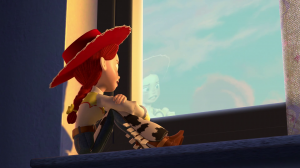 Jessie could have been welcomed solely off of “When She Loved Me,” but I love how she falls for Buzz instead of the more obvious match-up with fellow cowboy Woody. Bulls-eye comes to eventually replace Andy’s dog, who becomes old and fat. Barbies would reappear in Toy Story 3 with even greater comedic effect. Yet the reason why I love Toy Story 2 is because it tackles the issue of growing up from a toy’s perspective. Anyone who is reading this review can probably relate to Woody who wants to escape the pain of abandonment and be adored forever inside a glass cage. But can true love be achieved without any pain? Who knew that childhood toys could reveal so much of the essential human experience? How is this the Toy Story that doesn’t make IMDb’s top 250? Favorite moment: Jessie describes what it feels like to be played with. With Monsters, Inc., you can feel Pixar coming to grips with their identity. Whereas Flik was left partner-less, Sully and Mike are as much of a pair as Woody and Buzz were, establishing a tradition of partnerships that would serve Pixar well for an entire decade. Once again, Pixar decides to avoid featuring humans as central characters. There are some subtle differences, though, that make Monsters Inc. unique. First, this is the only Pixar film based off of the abstract. Toys, bugs, fish, cars, rats, and robots all somewhat limit character designs since they are rather well-defined entities. This is the first problematic element of Monsters Inc.: I don’t think the monster designs are very creative. Maybe it was due to the lack of technology, as its sequel would improve on this aspect drastically. Nonetheless, Monsters Inc. creatively uses its premise, tying in this abstract world with the familiar human world quite nicely. This tie would lead to the development of Boo, Pixar’s first human character who I really cared about. The fact that these monsters feared this tiny, harmless child made for some hysterical moments. 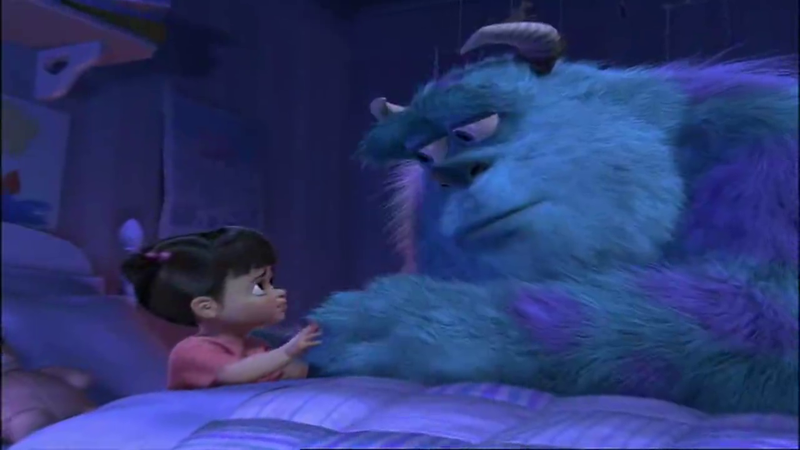 Moreover, Boo’s relationship with Sully made for one of Pixar’s more touching moments when Sully has to say goodbye to her. Not to mention, the action preceding this moment at the door factory is immensely entertaining. It’s not quite the Pixar classic people claim this to be, largely because I would have liked to seen more out of this monster world, but there is no denying that Monsters Inc. is worth a watch. It’s funny, it’s creative, it’s entertaining, it’s unique, and most importantly, Monsters, Inc. is touching. Favorite moment: Sully says goodbye to Boo. I’ve always felt that Monsters Inc. has been a little bit lost in the shuffle of Pixar’s greatness. Let’s not underrate the innovation here: For the first time, Pixar was animating an entirely imagined world, and they made it a rich and scary one. This one is more overtly allegorical than Toy Story, and rehashes a few elements from that series, including its use of an odd couple friendship. But I’ll contend that the third act of this movie is one of the most thrilling stretches of animation ever: From the moment Waternoose betrays Sulley and Mike, exiling them to the Himalayas with the Abominable Snowman, through the breathless chase in and out of doors, through the heart-tugging farewell between Sulley and Boo, it’s completely riveting. The sense and pacing of the humor sometimes feels like it’s out of a classic Looney Tunes movie, and a manic Billy Crystal steals the show. Great movie. Favorite moment: There are a lot of great ones but the first one that comes to mind is the bonus short on the DVD, “Mike’s New Car.” Makes me laugh hysterically every time. Nemo‘s omission from the Best Picture field of the 76th Academy Awards is, in my mind, one of the greatest Oscar snubs ever. Pass on TS1 because it’s more recognized for being technical innovation than a piece of art, okay. Pass on TS2 because it’s a sequel, sure. Pass on Monsters because it wasn’t even the most popular animated movie of the year, alright. But what’s the reasoning for passing on Finding Nemo? You’re telling me — with a straight face — that Seabiscuit and Master and Commander are better than this? Yet, I think the fact that I can write that previous sentence goes to show that Finding Nemo has stood the test of time. If you tell someone “a bunch of people paid to have opinions about movies declared Seabiscuit a greater movie than Finding Nemo” they should (and likely will) be outraged. This story of an overprotective clownfish who goes on an epic quest with an amnesiac tangfish is the most raucous, engaging kind of story — funny and dramatic and scary like Beauty and the Beast, sprawling and episodic like The Odyssey — paired with some of the most beautiful visuals ever featured in a movie. Like The Lion King, Nemo will always look incredible because of great design and color sense. This movie is simply a pleasure to LOOK AT, with saturated brights and a tactile texture. 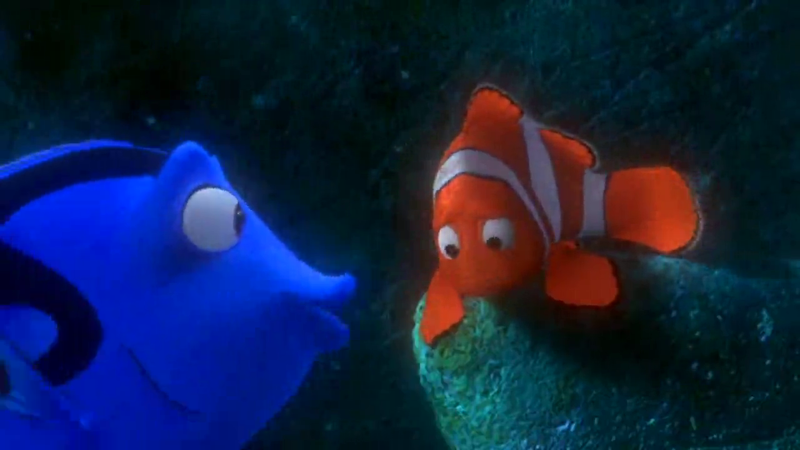 I also love that Finding Nemo is silly. Silliness is sometimes underappreciated. The wacky “I am Mrs. Nesbit” moment from Toy Story 1 feels a bit out of place next to The Incredibles or Up, but not next to Nemo and Dory speaking whale. I enjoy silly and wacky in small doses. Finding Nemo might not be Pixar’s greatest movie (though you can make the case), but I think it has to be Pixar’s MOST FUN movie. Finding Nemo is the first movie that convinced me of computer animation’s potential. It is the first computer animated film I thought was beautiful. And it needed to be, because we’re not talking about plastic toys here. We are talking about a landscape humans know less about than the moon. Pixar animates our oceans. Pixar perfectly depicts the fantasy-like quality of our oft-neglected underwater world. In some places it is dark, there are mine bombs, sunken ships for shark therapy session, ethereal myriad of floating jellyfish, sea turtles riding ocean currents, and giant krill-consuming, clown fish-expelling sea creatures. The scope of Finding Nemo makes the adventure feel like it takes place across the entire globe, and that’s because it does. Yet, the greatest adventure occurs internally in the heart of one fish. Finding Nemo is actually a pretty deceptive title, because while the physical journey is to Nemo, the real journey is within Marlin. After having terrible things happen to once-spouse Marlin, he is afraid of death. Through the partnership of the hilariously silly Dory and some poignant words from a 150 year old surfer-styled sea turtle, Marlin embarks on a journey in which he learns is what life is all about. Favorite moment: Marlin and Dory jump on jellyfish. The Incredibles is one of my favorite movies, easily ranking in my personal top ten animated movies. I love so much about what Incredibles does, and I wish more animated movies learned from it: It uses animation’s open-ended visual nature to tell a very visual story. Most animated movies are comedies that happen to depict talking cars or aliens or animals. Incredibles is one of the few that emphasizes the action and framing ahead of the script. The scenes that I first think of are the fantastic set pieces and fight scenes. Stuff that really feels like a comic book come to life way more than most “comic book” movies do. Elastigirl fighting off guards while stuck in a door, Frozone freezing a cop just as he’s about to get caught, Mr. Incredible fighting off Syndrome’s robot, etc., etc. This movie is a fun to just watch with your brain shut down. So cool to look at. But the script is absolutely fantastic, telling a mature story about a family where every member is struggling with their identity in the world. The story has so many jokes and subtle moments that just blow me away every time I watch it. The voice acting is superior and the movie’s thematic viewpoint is surprisingly nuanced and unorthodox. Syndrome is one of my favorite film villains, complex and evil in a way that feels unique. What it really comes down to is the family dynamic, though, and that’s where The Incredibles stands out from its peers. This movie cares about the relationships of its characters. There are some weird moments and flaws. I like that the movie doesn’t shy away from death, but it treats violence and pain a bit too haphazardly. The characterization is at first bit predictable before really heating up in the second half, and the run time is a bit flabby at almost two hours. But those are minor points: I would call this one of the few solid contenders for Pixar’s best movie. The Incredibles is a comedy, it’s a drama, it’s an action flick, it’s a family slice-of-life portrait, it’s about superheroes… It’s one of the most damn entertaining movies I’ve ever seen. The biggest question for me… As much as I’ve desperately wanted it for a decade, how the hell can a sequel live up to this? I, too, am craving for a sequel. I guess where we differ is our opinion on whether or not the sequel can surpass the original. The reason why I think a sequel can (easily) surpass The Incredibles is because I thought the second half of The Incredibles was much stronger than the first half. Sure, the second half is where the villain gets improply discarded from the screenplay, but it is also where the film starts to have a little bit of fun with itself. As Dan said himself, the first scenes that come to mind are the action sequences, and most of them occur in the second half. The first half is flat-out depressing. I often complain about family films feeling like children’s films, but wouldn’t it be equally bad if family films feel like adult films? Mr. Incredible saves someone from SUICIDE. He gets SUED. He hates his boss. He hates his job. He hardly cares about his family. How are kids able to sit through this? Then you have the issue of Syndrome, whose character arc never completes. Mr. Incredible even admits to Syndrome that it was wrong for him to push Syndrome aside as he did when Syndrome was Incrediboy, and yet, Mr. Incredible essentially kills him off with little remorse. As a Pixar film, The Incredibles is a sloppy, if entertaining entry. As a superhero film, The Incredibles is incredibly unique. The real heartbeat of the film is in its relationships within the family, and that was executed to near perfection. It is for this reason why I want to see a sequel. The Incredibles ended right when it started getting really, really good. Favorite moment: Jack-Jack reveals his superpower. It’s a shame we must temporarily leave our evaluation of Pixar’s work on this note. Even then, Cars is still quite average. Cars is not actively bad as it is passively mediocre. It doesn’t commit many mistakes. Character motivations are laid out and consistent, the ending is indeed moral, and there aren’t any gaping plot holes, at least none I could detect. At the same time, this film seems uninspired. I don’t understand why John Lasseter decided to make everything cars when they act exactly like us. The characters suffer from the same bland qualities of A Bug’s Life’s central characters. The plot seems like its a vehicle for running time instead of story. My favorite parts of Cars is when the plot is not progressing, which mostly consists of cars zooming around in circles. Pixar has never made a film that looked or sounded bad, and Cars is no exception. On a technical level, Cars meets the necessary specs of a Pixar film. One could wish that Cars cared less about horsepower and more about its direction. Favorite moment: McQueen goes on a drive with Sally. Kevin nailed it once again. No one could say it better than “Cars is not actively bad as it is passively mediocre.” This is a movie that works better as a plot synopsis (go read it on Wikipedia again if you haven’t in awhile — Cars is decently plotted). But it leaves you shrugging your shoulders a bit. I would never call it a bad movie. And I would never call it a great one. None of the characters are particularly memorable, and I can’t really recall a single specific moment from the movie except the intro and McQueen’s charming drive with Sally. This is a thoroughly unexceptional film… which I suppose makes it exceptional when greatness is the standard.